Sleep apnea is a common disorder that causes pausing during breathing while the afflicted person is asleep. This is often due to the upper airway collapsing, and it can lead to major medical problems. It is most often treated by continuous positive airway pressure, or CPAP, but this is not always tolerated. In fact, compliance is a major hurdle in treatment that sometimes cannot be overcome. One proposed alternative to CPAP is learning to play an aboriginal instrument called the didgeridoo. How might the circular breathing technique needed to play this instrument help to treat sleep apnea? The didgeridoo is a wind instrument that is common among the indigenous people of northern Australia. It is a cylindrical, wooden instrument that may be from 3 to 10 feet in length. It has been played for more than 1,500 years and is traditionally made from eucalyptus or bamboo with a mouthpiece of beeswax. Fortunately, you don't have to craft one out of a piece of wood. More modern versions of the didgeridoo can be made at little cost from PVC pipe and duct tape, and it is possible to make your own. For those who prefer a ready-made option, there are also professionally manufactured versions of didgeridoos that are marketed for sleep that cost $197. How does a didgeridoo work to improve breathing during sleep? 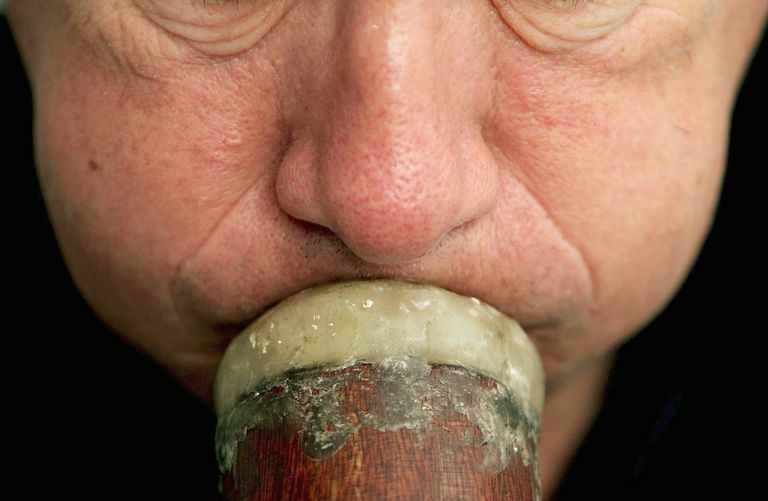 The didgeridoo is played with a special breathing technique called circular breathing. This involves breathing in through the nose while expelling air out of the mouth using the tongue and cheeks. Vibrating lips will produce a continuous drone that a skilled player can sustain for as long as desired, with the supply of air constantly replenished. It is believed that this technique may enhance the muscle strength in the tissues along the airway. This may be similar to the effects noted with myofunctional therapy. There is some research supporting this potential relationship. In a Swiss study published in the British Medical Journal in 2006, it was found that didgeridoo playing is an effective alternative treatment for moderate obstructive sleep apnea. It was hypothesized that the circular breathing technique may improve muscular tone of the upper airway and reduce the collapsibility that is common in sleep apnea. (This would help to improve obstructive sleep apnea, but would have no effect on central sleep apnea.) Twenty-five patients were enrolled in the study, given lessons, and practiced daily at home for 4 months. The enrolled study subjects practiced approximately 25 minutes a day, 6 days per week. Compared with a control group, daytime sleepiness and the apnea-hypopnea index (or the number of airway collapses per hour) improved significantly from 21 to 11.6. This dropped the severity from a moderate to mild level. Sleepiness was measured with the Epworth sleepiness scale and this improved from 11.8 to 7.4. Their partners also reported less sleep disturbance. There was not a measurable effect on the quality of sleep, however. Therefore, this study demonstrates that regular didgeridoo playing is an effective adjunctive treatment in people with moderate obstructive sleep apnea, improving some measures of the disease. It does seem that some residual mild sleep apnea still persists, however. For less than $10 worth of materials, and a little bit of practice to learn the technique of circular breathing, this might be a possible alternative for those who cannot tolerate their CPAP machines. Further research, involving a larger pool of subjects, may be helpful. This could help to determine who is more likely to respond to the treatment. There are many effective treatments available for sleep apnea. It can sometimes be helpful to revisit a therapy that may have failed before. Beyond CPAP, an oral appliance from a specialty dentist or even surgery may be additional options to consider. Weight loss and positional therapy may also have a role. If you are struggling to sleep well with untreated sleep apnea, consult with a board-certified sleep physician who can provide you with the guidance you need to succeed. Puhan M et al. "Didgeridoo playing as alternative treatment for obstructive sleep apnoea syndrome: randomized controlled trial." British Medical Journal. 2006; 332:266-270.